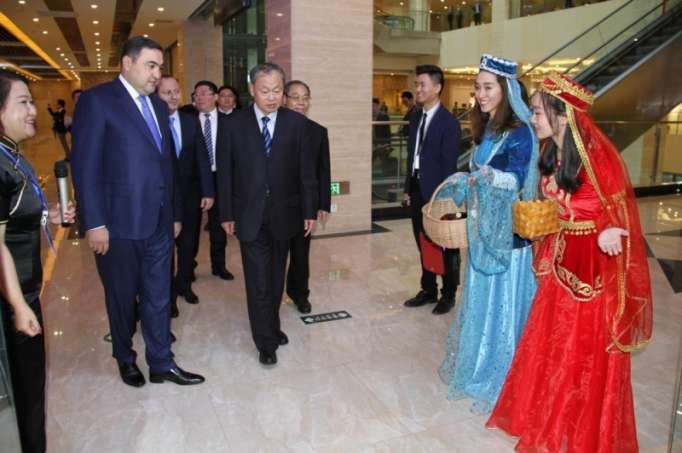 Azerbaijan’s first trading house has opened in China as part of “China Luzhou Southwest Commodity Expo”. In his opening remarks, Azerbaijani Ambassador to China Akram Zeynalli noted that Azerbaijan attaches great importance to the development of relations with China in all areas. Ambassador Zeynalli said that “One Belt One Road” initiative opens up new opportunities for the development of Azerbaijan-China bilateral ties. The event participants then viewed the trading house. The event also featured the screening of a documentary highlighting Azerbaijan’s achievements during the years of independence. The 6th China Luzhou Southwest Commodity Expo brought together 16 countries, including Azerbaijan as an honorary guest. Azerbaijan’s national pavilion in the exhibition featured different kinds of wines manufactured under the ‘Made in Azerbaijan’ brand. Addressing the opening ceremony, Ambassador Akram Zeynalli highlighted the development of relations between the two countries, as well as Azerbaijan’s economic and cultural cooperation with Chinese provinces.